We develop college and high school student-athletes and coaches into world-class leaders on and off the playing fields. We do this through engaging and interactive Leadership Summits, Retreats, and Academies – as well as our popular books like The Team Captain's Leadership Manual and online resources. As the world-wide leader in Sports Leadership development, the Janssen Sports Leadership Center offers cutting edge, comprehensive, and customized sports leadership training for college and high school athletic departments around the world. We work best with schools who are serious about leadership development and see it as a distinct competitive advantage. Based on our work with the nation's top colleges including Stanford, Michigan, Illinois, Arkansas, South Carolina, and over 250 schools across the nation, we can help you develop your student-athletes and coaches into world-class leaders on and off the playing fields. Our best-selling Team Captain's Leadership Manual has helped over 50,000 college and high school student-athletes become better leaders. 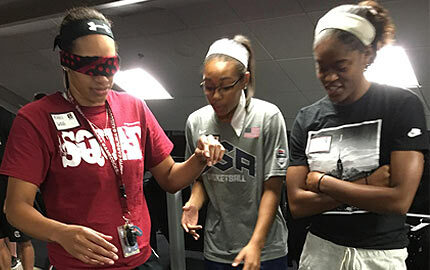 Develop your student-athletes into responsible and respected leaders with our popular Leadership Summits, Leadership Retreats, and Leadership Academies. Our Team Captains Network and the Championship Coaches Network websites have over 300 articles, interviews, team building activities, leadership tips, and peak performance strategies designed specifically for college and high school captains and coaches. Learn how to build, upgrade, or totally transform your team's Culture into a Championship one with our How to Build and Sustain a Championship Culture book and workshops. Build a motivated, committed, and cohesive team with our Championship Team Building book and Team Building Workshops and Retreats.